This above passage makes the New Heaven and the New Earth sound pretty nice, doesn’t it? After all, what could be better than to live for evermore in a world in which there is no more tears, death, sorrow, crying, and pain? GOD’S UNIVERSE NOT SO NICE!? Unfortunately, the fallen church-world paints a much different description of Heaven! Yes, the sad fact is, today’s churches and denominations have tenaciously clung to an archaic old church-doctrine from their mother-church. And this apostate church long ago established the claim that somewhere in God’s creation exists a torture chamber where pain and suffering and crying and sorrow and screaming and begging and intense torment goes on forever, throughout all eternity! Endless suffering and torment for almost all those who ever lived here on Planet Earth! You see, while the Bible does indeed speak of Hell, it does not speak of Hell as a place of eternal torment. In essence this false doctrine makes God into a liar! After all, this passage from Revelation 21:4, 5 clearly teaches that all tears, death, sorrow crying and pain will no more exist! Unfortunately the apostate churches of Europe engaged in some really bad Bible study to come up with this ridiculous notion that God has a giant torture chamber in which He is mercilessly tormenting as much as 90% of all people who ever lived throughout history! The problem is, instead of comparing and prayerfully balancing every related scripture concerning the nature of Hell, the erring theologians took the Parable of the Rich Man & Lazarus, along with the verse that says, “The smoke of their torment ascends up for ever and ever”. But the Bible pronounces a curse on any person that tries to cancel out any passage found in Scripture. And so, the apostate church in centuries past violated this above verse when they decided to make the Rich Man & Lazarus, a parable of many gross exaggerations, and “ever-ascending smoke” to be the sum-total of the nature of Hell. And in doing so, they had to ignore the many passages which speak of Hell as the grave. And as a result, they came under that curse, by their dismissing all those many “Hell is the grave” passages. The Bible is one whole doctrine. And any passage that is independently lifted out of the context of everything else the Bible has to say about a particular doctrine, is in danger of becoming a false doctrine. As this above verse from 1st Peter reveals, the Bible is one whole prophetic doctrine. And it is impossible to interpret any one passage privately, and out of context of the ALL of the Bible! Nowhere in this above passage does it speak of eternal torment! It only speaks of death in terms of trouble-free rest! And those who ignore or try to wrestle away the meaning of this above passage are perhaps giving evidence that their heart is not right with the Lord! Because, in essence, they have rejected this scripture in hopes of continuing to cling to this archaic false church-doctrine of “Eternal Torment”, handed down to them by the apostate Mother-of-Harlots in centuries past! But all those who have received the love for truth, will want to know EVERYTHING the Bible has to say on this doctrine and that doctrine, and every other Bible doctrine! And every truth-seeking individual will rejoice whenever he or she discovers any new hidden gem of truth, even if it results in having to discard any old wrong church-doctrine! But those who love their church and its doctrines more than they love the Bible in its entirety, will try to dismiss such passages as this above passage, Job 3:11-19, which clearly speaks of Hell as the Grave. NO ETERNAL TORMENT IN HEAVEN-MADE-NEW! These above words are “true and faithful”, as this above passage reveals! Heaven will not contain some Chamber of Horrors, in which 90% or more of Planet Earth’s past inhabitants will be screaming and writhing in endless torment through the ceaseless ages. When you really think it through, this whole idea of “Eternal Torment” is so ridiculous that it’s hard to imagine how any biblically-literate Christian could actually believe such unbiblical nonsense! But it’s a real testament of just how powerful church tradition can be! But much to the contrary, our signature passage instead reveals that all the “former things”, such as suffering, sorrow, pain, tears and even death, will be forever vanquished out of existence! And instead, the entire universe will then become a place of peace, and joy, and rest, and purity, and love. And throughout all the lush green eternal valleys and hills will be heard the echoes of innocent laughter, and singing, and liberty bells ringing in the total and final victory over evil. And we will be forever young! And no more will there be a place of suffering and torment! And this Promised Land will continue on for ever, and ever…Amen! With the addition of a single star, Theta Geminorum (the left hand of the Castor twin of Gemini), the sickle in Orion, the Reaper’s hand (sketch to left), now extends the blade, thus transforming that sickle into the hook of a shepherd’s rod and staff. And so now this little Gemini star becomes the tip of Orion’s Shepherd’s rod & staff. 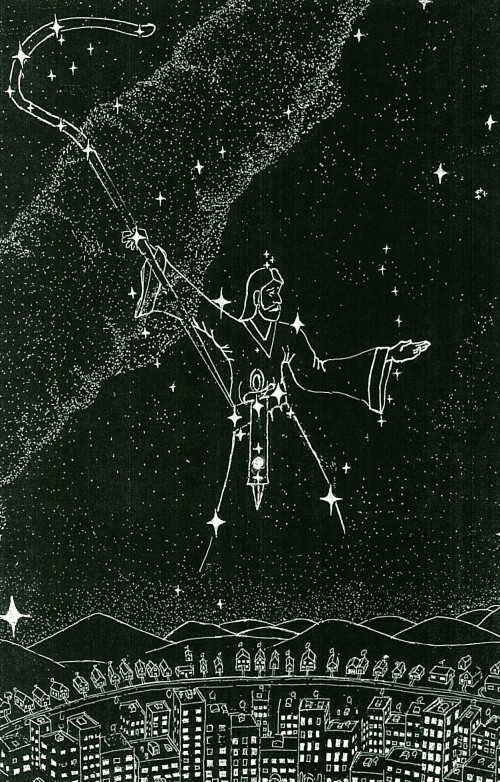 Thus with this additional star, Orion the Reaper Constellation now becomes the 5th personality of Orion: The Good Shepherd (sketch below right). Theta Geminorum is a class A3, 4th magnitude star, which means it is much fainter than either of the stars, Castor or Pollux. But faint as This little star may be, it nevertheless presents a giant concept, turning Orion’s sickle into a shepherd’s rod.